A T. Rex Treks To Washington For A Shot At Fame The Smithsonian is set to unpack something it's never had before: a rare, nearly complete Tyrannosaurus rex skeleton. It's a gift from a Montana museum that says this T. rex deserves to be famous. 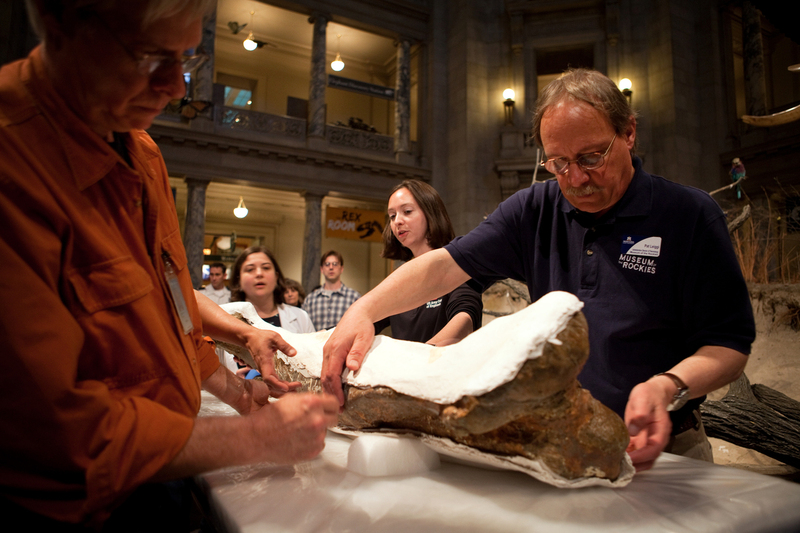 Pat Leiggi (right) of the Museum of the Rockies prepares to move a leg bone of the T. rex at the Smithsonian's Natural History Museum in Washington, D.C., on Tuesday. Most people don't know it, but the T. rex that's standing tall in the Natural History Museum in Washington, D.C., is a fake — a cast, a copy of the bones. It's an accurate replica, but for decades the Smithsonian has coveted a real skeleton of a T. rex — the charismatic, 30-foot-long beast that's not only deliciously frightening to contemplate but also fascinating to scientists. How did such an animal grow so large? How fast did it run? Was it a predator or a scavenger? Now, courtesy of the Museum of the Rockies in Bozeman, Mont., they've got one. On a recent day, the Bozeman museum's director, Shelley McKamey, shows off a cast of the T. rex's skull on exhibit. The skull is more than 4 feet long, almost as high, and its gaping maw could bite a cow in half. "This is MOR 555, which is the scientific name of the specimen," McKamey says. 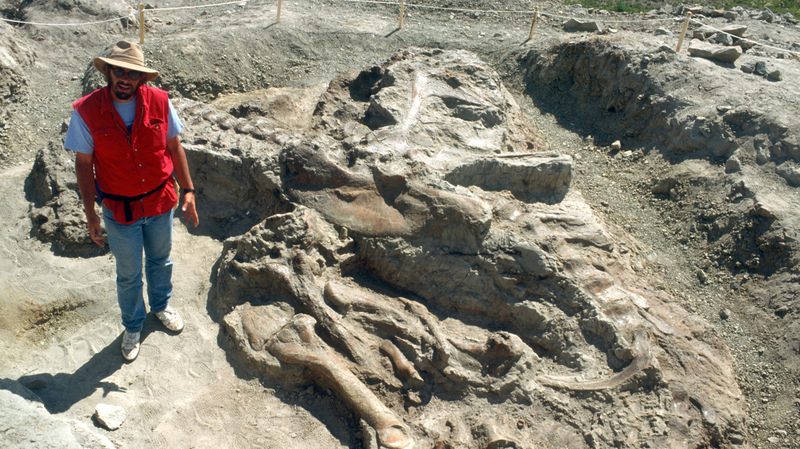 Jack Horner, curator of paleontology at the Museum of the Rockies, provides scale for Tyrannosaurus rex fossils at the excavation site in Fort Peck, Mont., in June 1990. This skeleton coming to the Smithsonian is no run-of-the-mill gift. Though it was found on federal land, and so belongs to the U.S. Army Corps of Engineers, it is commonly known as the Wankel — after the Montana rancher who found it. It is one of the most complete T. rex skeletons in the world; 80 percent of the animal's original bones are intact. So why give it up to the Smithsonian? It is a little bit like Christmas early, you know. It's very rare that you get to get your hands on even part of a T. rex, right? So there's almost a complete skeleton over there. "The opportunity for this T. rex to be probably the most visited, the most famous T. rex in the world," McKamey says, "you know, it deserves its chance in Washington." McKamey also points out that Montana is thick with dinosaur bones; 65 million years ago the place was practically crawling with T. rexes. The museum has another mostly complete T. rex — called Tex Rex — in its collection. Down in the basement at the Bozeman museum, workers pack the last parts of the Wankel T. rex bones into wooden crates on a loading dock to be trucked to Washington. Watching intently is a tall, brown-haired paleontologist who's the beneficiary of all this — Kirk Johnson, the new head of the Smithsonian's Natural History Museum. He's seeing the skeleton for the first time. 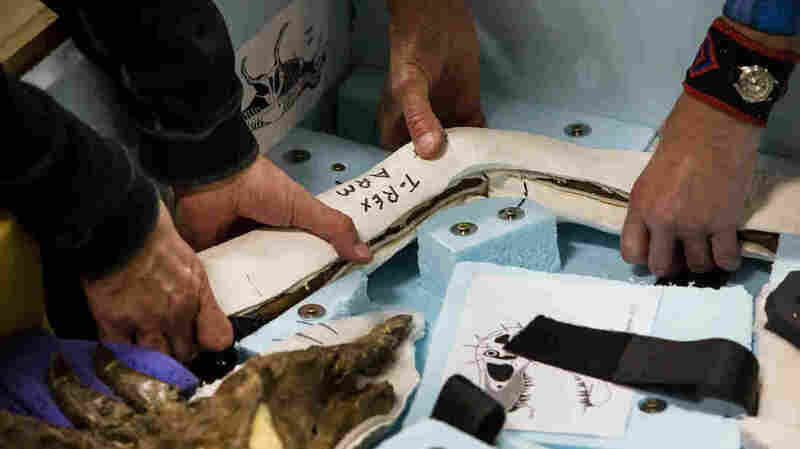 Scientists and others take one last look at the Wankel's bones before they make their way to Washington, D.C.
Johnson gives the dinosaur's arm bones, which are Velcro-ed into a white plaster cradle, his measured scientific opinion: "Wow. Wow. Wow." This was the first complete T. rex arm ever found. For such a giant beast, it's laughably small. "I mean, the amazing thing is, look at this," Johnson says, as he holds the T. rex arm next it his own. "It's like my arm — my arm is the size of the T. rex arm." As museum staff seal the box and tape it up, another scientist looks on with a big grin. Matt Carrano is the Smithsonian museum's curator of dinosaurs, and he's been waiting two years for this day. "It is a little bit like Christmas early, you know," he says. 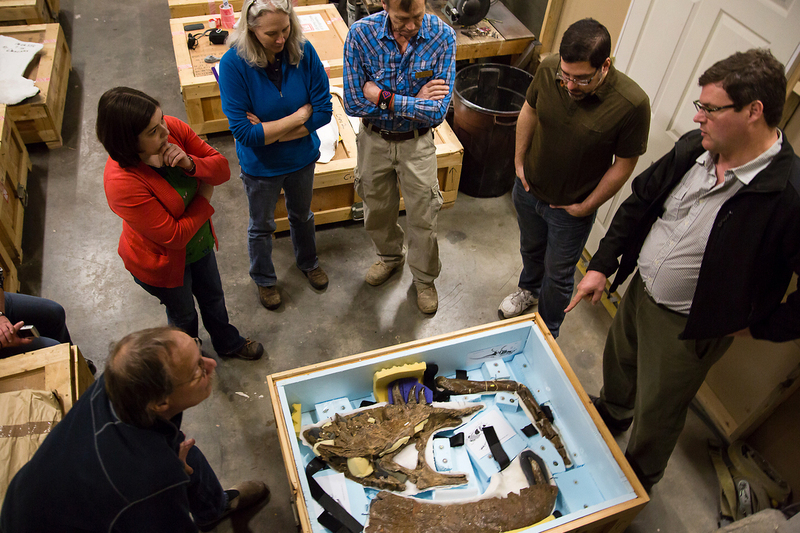 "It's very rare that you get to get your hands on even part of a T. rex, right? So there's almost a complete skeleton over there." The Wankel T. rex will be the star of the Smithsonian's new, $48 million dinosaur hall, now under construction. The museum draws 7 million visitors a year. But Carrano says there's also lots of new science to learn from such a complete skeleton. "You can do things like ask how old it was when it died, ask what kind of life it had before it grew up," he says. An arm bone of the Wankel T. rex is packed up at the Museum of the Rockies in Bozeman, Mont., on April 10. The Bozeman museum, in fact, has used the Wankel to pioneer work on dinosaur histology — the nature of the material inside the bones — something few paleontologists had done before. They found evidence of tissue and blood vessels in T. rex bones, including in the Wankel. Carrano says his first project with the Wankel is likely to be investigating the purpose of those little arms. Return to NPR.org for more coverage of how the Smithsonian plans to make this meat-eating giant the nation's most famous dinosaur.